When the weather gets warm there’s nothing better than an iced coffee to get your caffeine fix. These iced coffee recipes will definitely tickle your tastebuds. As soon as the temperature starts to creep up, reaching for the same old cup of coffee just doesn’t seem appealing. Your brain is craving its caffeine fix, but your body is screaming for something cold and refreshing. That’s where iced coffee recipes can tick all the boxes. But making the perfect iced coffee is about more than simply leaving your regular espresso out on the bench for a few hours. They combine classic coffee flavours with a subtle sweetness and a whole lot of ice to create a drink that is perfect for summer. There are many methods of making iced coffee, but our favourite also happens to be one of the easiest. 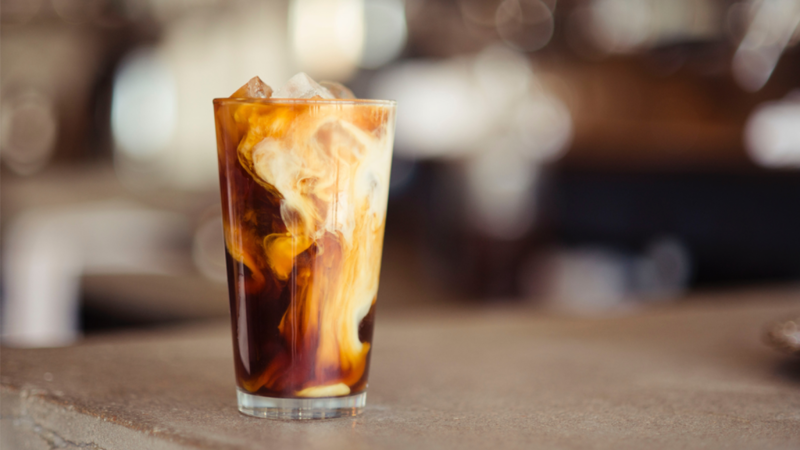 It uses traditional coffee flavours and cools it down with ice to make it an iced coffee in a flash, without any sweetness or competing flavours. Add ice to a glass, taking up 1/3 of the space. Top with cold milk, leaving about 2cm to the top of the glass. Pour a freshly made double espresso over the top. If you can’t imagine your coffee without a big helping of sugar, you can still get excited for iced coffees in the warmer months. There are many ways to add sweetness to your iced coffee. You can use condensed milk like in a Vietnamese coffee, dissolve your sugar with your espresso before pouring over your milk, or you can add a swirl of caramel syrup for a rich and creamy flavour. The main reason many people want sugar in their coffee is to offset the bitter flavours of coffee with a little sweetness. But did you know that you can achieve the same result without the sickening effects of sugar? A hint of vanilla in your coffee helps to round out the flavours while still keeping the integrity of the blend intact. To add the vanilla flavour, you can make a simple syrup similar to those found at most coffee chains. Using either freshly brewed coffee or a shot of espresso, put your coffee in the fridge to cool it right down. Make a simple syrup by adding ¼ cup of sugar and ¼ cup of water to a small pot. Heat on the stove and stir until the sugar starts to dissolve. Add 2 teaspoons of vanilla extract and stir to combine. After about a minute the vanilla should be incorporated and it should take on the thicker consistency of syrup. Remove from the heat and put in a bottle or sealed container. Put ice in a cup and top with milk and a dash of your vanilla syrup. Top with your chilled coffee and stir to combine. To make a blended frappe, add a cup of freshly brewed coffee to a blender with ¼ cup of milk. Top with a cup of ice. Blend for about 10 seconds, until the drink is the consistency of a snow cone. If you wanted to add any additional flavours you can do that here, then blend again until smooth and frothy. If you want to take your love of iced coffees to a whole new level, then you’re going to want to try making your own coffee granita. A granita is a semi-frozen dessert, similar to sorbet in texture, made from sugar, water and whatever flavour gets your tastebuds firing. To make a delicious coffee granita, simply combine 2 cups of freshly brewed coffee with ½ cup sugar until it completely dissolves. Pour the mixture into a shallow baking dish and cover with cling wrap before putting it in the freezer. Once it is completely frozen, use the tines of a fork to scrape the mixture out and serve.